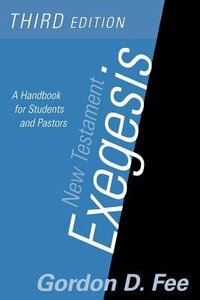 About "New Testament Exegesis (3rd Edition)"
This standard textbook assists both students and ministers by providing a practical method for careful exegesis of the New Testament. Now revised in its third edition, Fee gives step-by-step analysis of the exegetical procedures, a brief guide to exegesis for sermon preparation, and offers resources for further study. New Testament Exegesis presents many helpful insights into interpretation and can be used by itself, or as a companion to Douglas Stuart's Old Testament Exegesis, Third Edition. The third edition of this handbook provides a step-by-step guide to writing an exegetical paper on the New Testament. It takes into account the latest advances in methodology as well as resources. 10 illustrations.